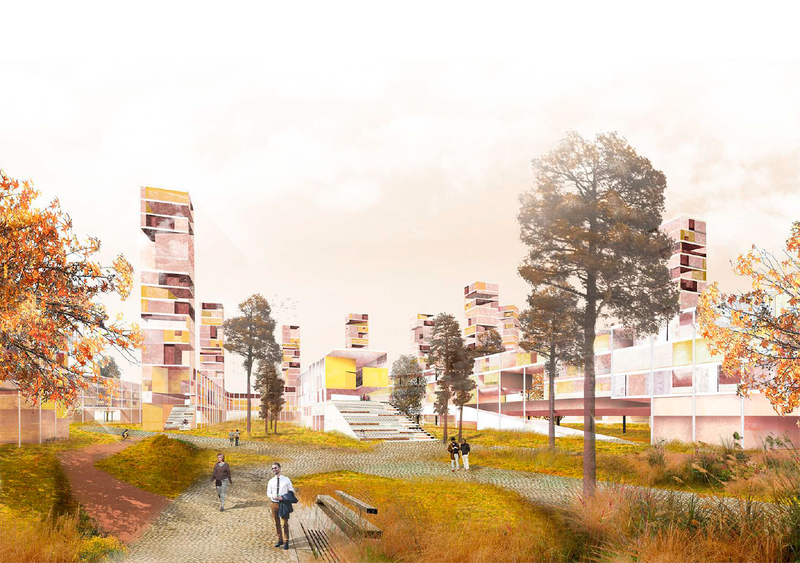 The proposal suggests a second mega-structure alongside the university, a “housing machine”. In the three-storey base mass, different housing typologies from houses to small blocks of flats would align with pedestrian and cycling routes. Slender tower structures crown the composition. The entry is aesthetically pleasing and unique with tight internal coherence and strong artistic character. Complementing the “study machine” of the over-sized university campus with a neighbouring “housing machine” is an intriguing approach that respects the existing architectural appearance of the area. Relying on natural formal motifs, the newbuilds would nonetheless present a strong autonomous identity. This creates a dialogue between the built environment of the introverted academic world and the free student and residential functions located within a natural context. 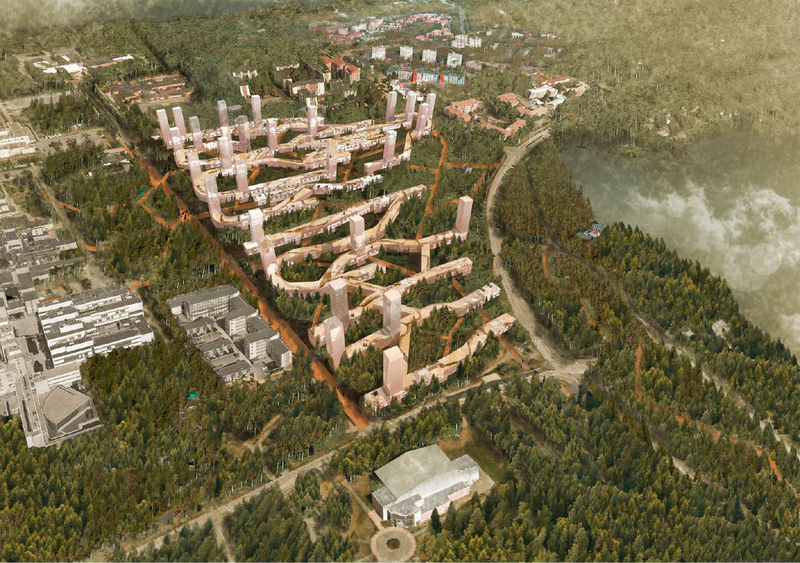 The powerful, high-profile design of the proposal would complement the ethos of the University of Oulu as an international scientific community. Some members of the jury found the entry excellent. However, the authors were not able to take their striking idea onto a more realistic level or introduce cohesion to the area. The urban structure remains ambiguous and the lack of hierarchy would lead users astray and leave them zigzagging between identical spaces. The design is therefore too monotonous for an area as extensive as this. It does not provide a new connection between the university and Kaijonharju. There are too many parallel roads for motorised traffic. Parking was presented merely on a schematic level, and the few parking spaces that were provided, where too centrally located. Contrary to what its name promises, the entry does not present a connection between the two lakes. Building within the forest while converting existing parking lots into woodlands was considered problematic and conflicting with the overall spirit of the entry. The three-storey height of the base mass and the towers with one flat on each floor would probably prove financially challenging in practice. Developing the concept further to be financially more realistic is still possible, but challenging, and it would run a great risk of falling short of the intended high-standard outcome. The campus of the University of Oulu in Linnanmaa and Kaijonharju’s urban center are closely related. But the main relationship that stands out is the one existing between these two sectors and the natural environment that surrounds them. Especially with the Pyykösjärvi and Kuivasjärvi lakes. However, the potential of this valuable environment is largely lost due to the disconnection caused by the highway and an obsolete transport network design. 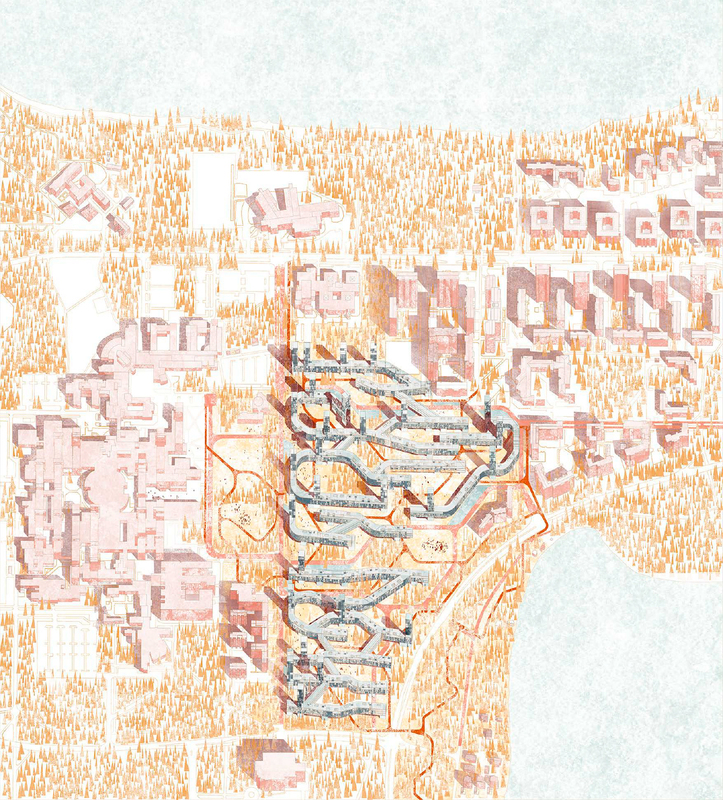 We propose a housing system and a productive area capable of melting with the environment, recovering it for people, and above all, reconnecting all elements of great scenic value to create a natural network that can be enjoyed both by the neighbors of Oulu and by visitors. Our proposal intends to achieve those goals with a number of sectors that combine domestic spaces with public spaces and productive areas. For the success of this proposal it is essential to carry out an important reflection on the viable means of transport in the area. Each one of the buildings is conceived as a unit for community life, however our proposal seeks to create a global sense of neighborhood by promoting a close relationship between all of them through a system of shared commerce, transportation and public spaces widely connected. We look for a varied range of public spaces. However the domestic spaces share common aesthetics , so that it is understood that the community is at the same time flexible and aware of its common goals. The total area to be built after completion of the three planned phases in the year 2040 will be of 185000 m2 and it will host about 4600 inhabitants. Special attention has been given to the natural environment, maintaining the abundant vegetation in the area and adding new plantations. This is achieved through the elevation of a part of the commercial streets, which run through the trees and allow the large garden to run under them uninterruptedly. This fact has great influence on the way we connect the transport routes. As a result, a complex and variable connection map is generated through the different stages of development. The majority of houses, destined to students, will be connected in a very direct way with the university, favoring the public transport and especially the use of the bicycle, The use of alternative transportation will allow to remove some of the large parking areas now existing on the university campus, recovering those spaces for students.